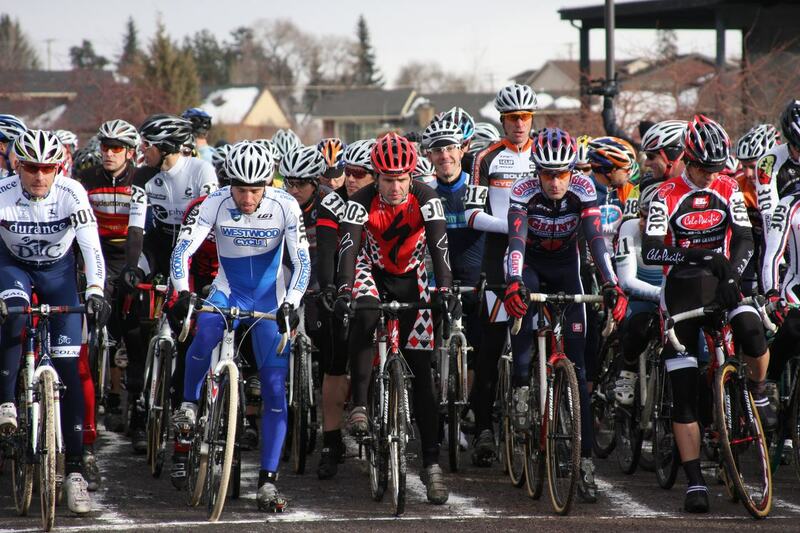 Dinorah Lawson rides the frozen snowy nationals course in Bend, Oregon. Jan 1 B&L Group Ride - Climb Palomar for New Year's Day - Meet 8:45 and Depart 9:00 From Lake Wohlford, Escondido. 12/29 - Ready to Race in 2010? Racing calendar is updated - pick your poison. 12/20 - SCPS #15/Finals, Santa Cross, Woodland Hills - Celo Pacific won the Team Competition for the 15-race series. Congrats everyone who raced and contributed! Individual 2009 Series Winners: Brent Prenzlow (Elite Men 1/2/3), James Walsh (Men 3/4), Jesus Ortega (Unofficial Men 4), Drew Campagine (Junior Men 10-14), Mark Campaigne (Single speed 3/4). OVERALL Individual & Team Standings. Santa Cross indiv results - Elite Men - 2nd, Brent Prenzlow; Elite Women - 12th, Annette Padilla; Men 3/4 - 1st, James Walsh, 6th, Mark Campaigne; Masters 35+ 1/2/3 - 1st, Brent Prenzlow, 7th, Ben Jones; 35+ 3/4 - 8th, David Lawson, 22nd, David Williams, 25th, Jesus Ortega; W35+ - 6th, Dinorah Lawson, 9th Annette Padilla, 10th, Pey-Lih Littler; Singlespeed 1/2/3 - 8th, Thad Sparrow; SS 3/4 - 5th, Mark Campaigne, 11th, Annette Padilla; Youth - 3rd, Jameson Campaigne; 10-14 - 7th, Drew Campagine; Cat 4 - 17th, Jesus Ortega, 18th, David Williams. Full results here. Race Report here. Photos by the Lawson's here. 12/19 - Racers & Chasers, MTB XC at Balboa Park/San Diego - Laurie Tremor, 1st (W Sport 40-49); Brent Prenzlow 1st (Pro Men); Dan Breyer, 5th (Expert 30-39); Jack Guenther 1st (Beg Men 60+). Full results here. 12/16 - New Photo Set from Adams Ave CX by Richard Murphy. 12/14 - Toys for Tots club ride is Saturday December 19th (Northbound route). Please bring an unwrapped toy with you on the club ride and we will drop them all off at the front gate of Camp Pendleton as we ride through. Thanks for your support and participation. Click here for more info about Toys for Tots. 12/10-13 - Cyclocross Nationals, Bend Oregon - Masters 65-69 - Lee Willmore, 10th; Single speed - Brent Prenzlow, 14th, Lee Willmore, 89th & Annette Padilla, 90th; Women Masters 40-44 - Dinorah Lawson, 36th & Annette Padilla, 43rd; Masters 40-44 - Brent Prenzlow, 15th & David Lawson, 118th; Elite Women - Annette Padilla, 87th. Full results here. Photos - Annette Padilla in the SS race. 40-44 Mens start on pavement. Lawson runs the stairs. 12/13 - Tom's Farm Time Trial - Paul Miller (50+) 2nd (21:08). Delivery will be late February 2010. Artwork is not yet available, however the clothing will be similar to 2009. 12/9 - SCPS CX Team competition - Celo Pacific is still leading the team competition with one race to go. Make sure to attend the finals (Santa Cross) so we can hold our lead & receive the team trophy. Check out the standings here (Team Standings tab on bottom). 12/9 - Best of San Diego Cyclocross - Overall top pts from Anza, Storm the Beach and Adams Ave races: Mens 1/2/3: Brent Prenzlow; Men 3/4: James Walsh; SS 3/4: Mark Campagine; 35+ 3/4: David Lawson; Youth: Jameson Campagine. Congrats to all our Celo Pacific winners! 12/6 - Piru Time Trial - Paul Miller (55+) 1st (29:46). 12/6 - SCPS #14: Adams Ave 'Cross, Balboa Park/San Diego - Brent Prenzlow, 1st (Elite 1/2/3) & 1st with Ben Jones 4th (M35+ 1/2/3); James Walsh 1st, Mark Campagine 10th, Dan Breyer 19th (3/4); David Lawson, 3rd, Tony Kowalczyk 21st & David Williams 22nd (M35+ 3/4); Pey-Lih Littler, 7th & Annette Padilla, 8th, (W 1/2/3); Dinorah Lawson, 3rd, Annette Padilla 5th, and Clare Campaigne 7th (W35+); Richard Murphy 14th (45+); Mark Campaigne 5th (SS 3/4). Clarissa Ortega 4th (Girls 10-14); Jameson Campagine, 1st (Youth); Sean Haney 10th, Ben Littler 20th, David Williams 22nd, and Jesus Ortega 23rd (Cat 4); Michael Mogiello 6th, Matthew Wier 7th, & Drew Campagine 11th (10-14); Pey-Lih Littler 9th & Cherry Deolaso 11th (W 3/4). Full results here. Photo Set from Adams Ave CX by Richard Murphy. 12/1 - Convert Cross Photos by Lee Willmore here, More by Ed Garcia here, and by Richard Murphy posted here. 11/29 - SCPS #13: Turkey Trot 'Cross, Glendale - Brent Prenzlow, 3rd (Elite 1/2/3); Jeff Sanford, 4th, Ben Jones, 8th (M35+ 1/2/3); David Lawson, 6th (M35+ 3/4); Mark Campaigne, 8th, Andrew Dickinson 10th, Dan Breyer 24th (3/4); Annette Padilla, 10th, Pey-Lih Littler 11th (W 1/2/3); Dinorah Lawson 10th, Clare Campaigne 11th, Annette Padilla 13th, Cherry Deolaso 14th (W35+); Pey-Lih Littler 16th (W 3/4); Lee Willmore, 18th, Jim Cushing-murray, 19th (55+). Full results here. 11/26 - Tom's Farm Time Trial - Paul Miller (50+) 4th (20:35). 11/22 - SCPS #12: Convert Cross, SCNCA District Championships - Brent Prenzlow (Silver medal, Elite 1/2/3); Jeff Sanford (Silver medal, M40-44); Dinorah Lawson (Bronze medal, W40-44); Ben Jones 4th (M35-39), Annette Padilla, 4th (W40-44) & 9th (W 1/2/3); Lee Willmore 4th (M60+); David Lawson 13th, Richard Murphy 16th (M40-44), James Walsh 7th, Mark Campaigne 8th, Dan Breyer 16th (Cat 3); Clare Campaigne 5th (W40-44), Drew Campaigne 2nd (10-12); Jameson Campaigne 1st (Youth). CXMagazine Race Report here. 11/15 - Urban CX #4, Torrence - Annette Padilla, 4th (1-3); Jesus Ortega, 6th (Cat 4); David Williams 9th (45+); Lee Willmore, 3rd (55+); Thad Sparrow, 2nd (SS A); Pey-Lih Littler 5th, Kimberly Huynh, 6th (W3/4). Full results here. 11/15 - SCPS #10: San Luis Obispo - Jeff Sanford 2nd (M35+ 1/2/3); David Lawson, 6th (M35+ 3/4); Dinorah Lawson, 7th (W35+). 11/14 - Santiago Cyn Time Trial - Paul Miller (50+) 2nd (29:19). 11/14 - 12 Hrs of Temecula #2 (Mtb) - Heith Masters 8th beginner men solo, Andrew Dickinson 3rd singlespeed solo. results here. 11/10 - 2010 Membership form pdf is posted and ready for your submission. 11/8 - SCPS #10: Bakersfield, Day 2 - Brent Prenzlow, 5th (1/2/3); Mark Campaigne 10th (3/4); Annette Padilla, 5th (W 1/2/3); Jeff Sanford 2nd, Ben Jones 4th (M35+ 1/2/3); Mark Campaigne 5th (SS 3/4); David Lawson 11th (35+ 3/4); Clare Campaigne 4th, Annette Padilla 5th (W35+); Drew Campagine, 3rd (Jr); Jameson Campaigne 1st (Youth). Full results here. Race Report here. Photo set by David Lawson. Photo set by Ben Jones. 11/7 - SCPS #9: Bakersfield, Day 1 - Brent Prenzlow, 1st (1/2/3) & 1st (Singlespeed 1/2/3); James Walsh, 1st, Mark Campaigne 4th, Ryan Weeger 13th (3/4); Annette Padilla, 9th (W 1/2/3); Jeff Sanford 4th (M35+ 1/2/3); Mark Campaigne 3rd (SS 3/4); David Lawson 6th (35+ 3/4); Clare Campaigne 5th, Annette Padilla 6th (W35+); Jesus Ortega 4th, David Williams 5th (Cat 4); Drew Campagine, 2nd (Jr); Jameson Campaigne 1st (Youth). Full results here. 11/5 - Storm The Beach Cyclocross Photo Set by Richard Murphy posted. 11/4 - A Cyclocross Century: Brent Prenzlow rolls to 100th Win - CX Magazine article. 11/3 - Storm The Beach recap - A Huge Thank You to Mark Campaigne, race director! This race would not be possible without him! Mark adds, "THANK YOU to all the volunteers and racers today who helped make our event such a success. Congrats to Brent Prenzlow on his 100th Elite Cyclocross win! Great job to all." 11/1 - SCPS #8: Storm The Beach, Oceanside - Brent Prenzlow, 1st (1/2/3); James Walsh, 1st, Mark Campaigne 6th, Andrew Dickenson 10th, Ryan Weeger 17th, Dan Breyer 19th (3/4); Annette Padilla, 13th (W 1/2/3); Ben Jones, 2nd, Jeff Sanford 5th, Phillip Gray 8th (M35+ 1/2/3); Ben Jones 1st, Mark Campaigne 2nd, Jeff Sigua 15th (SS 3/4); Mark Hoover 8th (SS 1/2/3); David Lawson 4th (35+ 3/4); Dinorah Lawson 5th, Annette Padilla 9th (W35+); Grant Chu 18th, Richard Murphy 21st (45+); Andrew Dickinson 3rd, David Williams 13th, Tony Kowalczyk 19th, Jesus Ortega 20th (Cat 4). Full results here. New -> Elliott and Prenzlow Master the Sand at Socal's Storm The Beach by David Lawson. 10/25 - Urban CX #3, Santiago Cyn - Annette Padilla, 5th (1-3); Brent Prenzlow, 1st (Elite Men Pro-Open). Full results coming soon. 10/24 - SCPS #7: Spooky Cross, Irvine - Brent Prenzlow, 1st (1/2/3) & 1st (SS 1/2/3); Annette Padilla 14th (W1/2/3) & 9th (35+); Mark Campaigne 12th (3/4); Leigh Adams 11th, Berlinda Cordova-Weir 17th (W3/4); Ryan Weeger 14th (Cat 4); Thad Sparrow 10th (SS 1/2/3); Mark Campaigne 3rd (SS 3/4); Jameson Campaigne 4th (U10); Matt Weir 9th Drew Campagine 10th (10-14); Lee Willmore 14th (55+); Richard Murphy 9th (45+); Dinorah Lawson 5th, Annette Padilla 9th, Clare Campagine 10th (W35+); Ben Jones 12th (M35+ 1/2/3); David Lawson 17th (35+ 3/4) Race report here. Full results here! 10/22 - SCPS Overall Standings & Team competition - Celo Pacific is currently leading the team competition & several Indiv cats! Check out the standings here (Team tab on bottom). Keep it up!! 10/20 - Updated Flyer for Storm The Beach Cyclocross has been posted. 10/18 - SCPS #6: Eldorado Park, Long Beach - Brent Prenzlow, 1st (1/2/3) & 1st (SS 1/2/3); James Walsh, 2nd (3/4); Annette Padilla 11th (W1/2/3); Jeff Sanford, 3rd, Ben Jones, 11th & Alex Ter-Vrugt 12th (35+ 1/2/3); Mark Campaigne, 1st (SS 3/4); Dave Lawson 17th (35+ 3/4); Leigh Adams 8th & Pey-Lih Littler 18th (W 3/4); Dinorah Lawson, 8th, Clare Campaigne 10th & Annette Padilla 11th (W 35+); Lee Willmore 13th (55+); Ryan Weeger 8th, Jesus Ortega 22nd & David Williams 23rd (Cat 4) . Full results here. 10/18 - Tom's Farm Time Trial - Paul Miller (50+) 3rd (20:38). 10/16 - Club Meeting and breakfast/lunch - this Saturday at the Grand Deli after the group ride. Don't miss it! 10/11 - Fiesta Island Time Trial, San Diego - Paul Miller (50+) 6th at 28:24. Matt Bigos (1/2/3) 7th (32:53) and Mike Coday (3/4) 7th (28:40). Full results here. 10/11 - SCPS #5: Bonelli Park, San Dimas - Jeff Sanford, 2nd & Phillip Gray 9th (M35+ 1/2/3); James Walsh, 1st & Mark Campagine 8th (3/4); Mark Campaigne, 1st (SS 3/4); Dave Lawson 5th (35+ 3/4); Dinorah Lawson 6th (W 1/2/3); David Williams 17th & Jesus Ortega 19th (Cat 4); Drew Campaigne 3rd (10-14); Dinorah Lawson 6th & Clare Campaigne 7th (W 35+) . Full results here. 10/11 - Urban CX #2, Palos Verdes Estates - Thad Sparrow, 1st (Single Speed); Annette Padilla, 3rd (1-3) & 4th (3/4); Brent Prenzlow, 1st (Elite Men Pro-Open). Full results here. 10/10 - SCPS #4: Bonelli Park, San Dimas - Brent Prenzlow, 1st (1/2/3) & 1st (SS 1/2/3); Jeff Sanford, 1st, Phillip Gray 6th & Alex Ter-Vrugt 7th (M35+ 1/2/3); James Walsh, 1st (3/4); Annette Padilla 12th (W1/2/3); Mark Campaigne, 3rd (SS 3/4); Dave Lawson 5th (35+ 3/4); Leigh Adams 8th & Kimberly Huynh 10th (W 3/4); David Williams 11th & Jesus Ortega 14th (Cat 4); Dinorah Lawson 4th, Annette Padilla 7th, and Clare Campagine 8th (W 35+); Drew Campaigne 2nd (10-14). Full results here. 10/10 - Santiago Cyn Time Trial - Paul Miller (50+) 3rd (29:12). 10/9 - New Photo Set from Velocity Cross by Richard Murphy! 10/4 - SCPS #3: Live Oak Cyn Park, Orange - Brent Prenzlow, 1st (1/2/3) & 1st (SS 1/2/3); Jeff Sanford, 1st (M35+ 1/2/3); James Walsh, 3rd (3/4); Laurie Tremor, 3rd (W35+); Annette Padilla 9th (W1/2/3) and 11th (W35+); Dave Lawson 9th (35+ 3/4); Mark Campaigne, 1st (SS 3/4). Full results coming soon... James' Race report. 9/27 - SCPS #2: Cahuilla Creek MX Park, Anza - Brent Prenzlow 1st men-1/2/3; Lee Wilmore 6th singlespeed-1/2/3 and 7th 55+; Annette Padilla 3rd women-1/2/3 and 6th w35+; Phillip Gray 3rd and Alex Ter-Vrugt 5th 35+ 1/2/3; Mark Campaigne 2nd men-3/4 and 2nd singlespeed 3/4; Andrew Dickinson 7th men-3/4 and 5th men-4; Dave Lawson 3rd 35+ 3/4; Leigh Adams 1st women-3/4; Richard Murphy 8th 45+; Dinorah Lawson 2nd, Laurie Tremor 3rd, Clare Campaigne 4th, and Berlinda Weir 7th women 35+; Matt Weir 1st and Drew Campaigne 2nd Jr boys 10-14; Jameson 1st youth U10. Race report on cxmagazine! Full results here. 9/23 - CrossVegas, Las Vegas, NV - Brent Prenzlow, 38th (Elite Men). Full results/report here. 9/20 - Urban CX #1, Ken Malloy Park (Harbor City) - Brent Prenzlow, 1st (Elite Men Pro-Open); Mark Campaigne, 2nd & Phillip Gray 5th (Masters 35+ 1/2/3); Annette Padilla, 1st (Elite Women) & 3rd (Women 3/4); Full results here. 9/20 - US Cup Unification MTB Race, San Dimas - James Walsh, 1st (Cat 1 30-34). Jeff Sanford, 3rd (Cat 1 SS). Race report here. Full results here. 9/19 - SoCal CX Prestige Series (SCPS) #1, San Dimas - Brent Prenzlow, 2nd (Elite Men); Jeff Sanford, 5th (Masters 35+ 1/2/3); James Walsh, 2nd (Men 3/4); David Lawson, 9th (Masters 35+ 3/4); Mark Campaigne, 2nd (SS 3/4); Dinorah Lawson, 4th (W 35+); Matthew Weir, 5th (Junior 10-14). Full results here. 9/19 - Mt Charleston Hill Climb, Las Vegas - Matt Sheremeta won the Cat 4 race. 9/17 - Storm The Beach Flyer is now available - 2009 Race Flyer (pdf). 9/14 - Cyclocross Starts This Weekend! - The local cyclocross schedule has been updated on our racing calendar. 9/13 - Fiesta Island Time Trial, San Diego - Matt Bigos, 8th (Cat 4/5), Scott English, 18th (40-49), Annette Padilla, 6th (40-49). Full results here. 9/5 - Harlan Ranch Criterium, Clovis - David Lawson took 7th in the 35+ 4/5's. 9/4 - Hellyer Velodrome Track race, San Jose - Charles Cushman 5th (3/4 Omnium) & 4th (3/4 Pts Race). 9/1 - Ben Jones rode all the famous Tour climbs in the Alps on the "La Marmotte" route - Check out his trip report here. 8/30 - Rim Nordic Mtb XC #4/Finals - James Walsh 1st (Cat 1 30-34), Mark Campaigne 4th (cat1 40-44); Beth Gerdes 1st (Cat 2W 19-29); Andrew Dickinson 1st (cat2 singlespeed); Jeff Sigua 1st (cat 3 25-29); Heith Masters 4th (cat3 30-34); Clare Campaigne 2nd (cat 3W, 40+); Drew Campaigne 1st (10&under). James, Andrew, Heith, Jeff, and Drew were also overall series winner's for their categories. Full results. James' Race Report. 8/23 - Ontario 5 Criterium - Jason Hock, 19th; Andrew Dickinson, 22nd (Cat 4) and 8th (Masters 30+ 4/5). Pey-Lih Littler, 22nd (W3/4). Full results here. 8/15 - Racers & Chasers Mtb XC, Cahuilla Creek Motocross Park (Anza) - Beat the Heat #3: Dave Lawson 1st (Beg 40-49); Annette Padilla 1st (Beg. Women 40-49). 8/10 - Unfortunately Randy Clark has passed - In his last days, Randy, an avid cyclist said, "Ride your bike like you mean it, and be aware of sun protection!" Don't forget your sunscreen and enjoy every ride. We will miss you! 8/8 - Mark Reynolds Rim Nordic MTB Stage Race - James Walsh 1st, XC (cat1 30-34); Griffith Vertican 1st Overall (cat1 30-34); Mark Campaigne 3rd Overall (cat1 40-44); Andrew Dickenson 1st Overall (cat2 Singlespeed); David Lawson 1st Overall (cat3 40-44); Heith Masters 1st Overall (cat3 30-34). 8/7 - Randy Clark Benefit Event - The Road to Roubaix will be shown MONDAY AUG 10th at Stone Brewery Escondido. Randy has adv liver cancer and is fighting for his life! Flyer is here. 7/26 - San Marcos Criterium - Chan Huynh, 26th (Cat 3); Pey-Lih Littler, 17th (Womens 3/4). Full results. 7/26 - Rim Nordic Mtb XC #2 - James Walsh 1st & Griffith Vertican 2nd (cat1 30-34); Ryan Weeger 3rd (cat1 25-29); Mark Campaigne 5th (cat1 40-44); Andrew Dickinson 1st (cat2 singlespeed); Drew Campaigne 1st (cat3 10&under); Jeff Sigua 2nd (cat3 25-29); Lee Wilmore 3rd (cat3 55+); Heith Masters 3rd (cat3 30-34); Clare Campaigne 3rd (cat3 women 40+). Full results. Photos by Jeff. 7/19 - Ontario GP Criterium - Andrew Dickinson, 20th (Cat 4) and 19th (Masters 30+ 4/5). Full results here. 7/12 - CA Mtb State Series #8, Big Bear - Griffith Vertican 2nd (Expert 30-34). Full race results here + Final Series results are here. 7/4 - Racers & Chasers Mtb XC, Cahuilla Creek Motocross Park (Anza) - Beat the Heat #2: Ryan Weeger, 2nd (Expert 20-29); James Walsh 4th (Expert 30-39); Annette Padilla 1st (Beg. Women 40-49). Full results here. 6/28 - CA Mtb State Series #7/Rim Nordic #1, Running Springs - Griffith Vertican 1st & James Walsh 2nd (cat1 30-34); Mark Campaigne 11th (cat1 40-44); Drew Campaigne 2nd (jrs 10&under); Heith Masters 2nd (cat3 30-34); Andrew Dickinson 3rd (cat2 SS); Lee Wilmore 4th (cat3 55+); Jeff Sigua 4th (cat3 25-29). Full results here. Photo set here. 6/28 - Mt Lemmon Hill Climb, Tuscon, AZ - Matt Sheremeta was 3rd (Cat 4). Full results here. 6/22 - Thanks to everyone who attended the club meeting and team photo - Click here to view. 6/21 - San Pedro Criterium - Glenn Masuda 17th (Cat 4). Full results here. 6/16 - SD Velodrome Tues Night Racing - John Genovese and David Lawson raced. John is working on his speed in the A's. David was 3rd overall in the 20 lap pts race (Cs) and is getting ready to move into the Bs. 6/13 - Ontario 4 Criterium - Andrew Dickinson won with Glenn Masuda 14th (Cat 4); Jason Hock 18th (Cat 3). In the Cat 4/5, Andrew Dickinson 16th & Charles Cushman 21st. Full results here. 6/13 - Palomar Challenge Hill Climb - Matt Sheremeta was 2nd overall racing up East Grade in miserable conditions; rain, fog, no visibility and very cold! Full results here. 6/13 - Racers & Chasers Mtb XC, Vail Lake (Temecula) - Beat the Heat #1: Griffith Vertican 1st and James Walsh 4th (Expert 30-39); Mark Campaigne 5th (Expert 40-49); Annette Padilla 1st (beg. women 40-49). Full results here Team Photo here. 6/12 - The 2nd '09 clothing order from Voler has arrived - David will be at the Parking lot where the Saturday ride starts, after the ride has ended. Approx 12:15 pm this Saturday June 13th to distribute clothing. 6/12 - Benefit Ride for Mike Trone - Mike was injured on his road bike on the Tuesday night Rancho Santa Fe Swami's ride. He was in a sprint, handlebars broke and face down into the pavement. Mike has NO insurance. There is a ride on Sunday June 14th, 8am at El Camino Bike. About 25-30 miles. Please attend and donate if you can help out. 6/7 - CA Mtb State Series #6, Santa Barbara - new member James Walsh won the Cat 1, 30-34. Congrats and welcome to the team - race report here. Full results here. 6/6 - SCNCA District Road Race Championships, Bakersfield, CA - Brent Prenzlow was 7th in the Masters 40+, and Griffith Vertican finished 18th in the Masters 30+. Full results here. 6/2 - SD Velodrome Tues Night Racing - John Genovese moved up to As and represented well (results coming) and in the cat Cs, David Lawson placed 3rd (Win-and-Out), 3rd (Pts race), and 4th (Temp). 5/31 - CA Mtb State Series #5, Big Bear - Griffith Vertican 2nd (cat 1, 30-34); Mark Campaigne 7th (cat 1, 40-44); Annette Padilla 11th (cat 2 Single speed) WSS Podium; Drew Campaigne 5th (Junior <=10); Matt Weir 8th (Junior 11-12). Full Results here. 5/29 - SD Velodrome "Fri Sprint Night" - Charles W. Cushman III took 2nd place in the cat B sprints. Come on out and join him next time! 5/26 - San Diego Velodrome Tues Night Racing - John Genovese won the "Win-and-Out" (cat B) and Charles W. Cushman III won the "unknown distance" and points race (cat C/D). 5/24 - Barry Wolfe Memorial Criterium, Woodland Hills - Glenn Masuda was 12th (Cat 4). Full results here. 5/23 - SCNCA District Time Trial Championships, Lake Los Angeles, CA - Annette Padilla was a bronze medalist today (40-44) in 1:06:52. In the Cat 4s, Jason Habeger was 27th (54:47) and Matt Bigos was 43rd (1:01:52). Full results here. 5/23 - Palm Bluffs Criterium, Fresno - David Lawson took 13th in the 35+ 4/5's after his two-up break was caught with one lap to go. Dinorah Lawson did her first ever race on the road and ended up 14th in the Women's 1/2/3/4. 5/19 - San Diego Velodrome Tues Night Racing - John Genovese won the B's Win-and-Out. David Lawson was 2nd in the C/D's Scratch race. 5/17 - Mid-Season Ontario Criterium - Jason Hock 23rd (Cat 3); Andrew Dickinson 3rd & Glenn Masuda 14th (Cat 4); Andrew Dickinson, 10th & Charles Cushman, 25th (Masters 30+ 4/5). Full Results here. Photos here. 5/12 - San Diego Velodrome Tues Night Racing - Charles Cushman, John Genovese, and David Lawson all competed. John raced solid in the B's. Dave picked up at least two 3rd places and likely a third in the C/D's. In the last race, a 15 lap points race, Charles attacked from the gun and stayed away picking up all the sprints while Dave blocked. Results coming soon. Click here to watch a video about the racing. 5/10 - Fiesta Island 20K Time Trial, San Diego - Justin Scarfeo, 2nd (Men 19-29); Annette Padilla, 8th (40K); Mike Coday, 10th (Men 4/5). B+L Fiesta Island TT Full Results here. 5/9 - Racers & Chasers Mtb Spring Series Finals, Vail Lake (Temecula) - Andrew Dickinson, 1st (Sport SS), Jeff Sigua, 2nd (beginner 19-29); Annette Padilla, 1st (women SS and series winner); and Griffith Vertican 1st (Expert 30-39 and series winner). Also, Griffith, 2nd - Super D. Results are here. Photos are here by Jeff. More photos here. 5/8- SLR Photos/Results - Full RESULTS are now posted here. SLR Race photo set now up on flickr by Dinorah Lawson. 5/3 - San Luis Rey - A nice day for racing; thanks to all the racers for supporting the event despite the forced changes. A big thanks to all our volunteers! Celo team rider results - Brent Prenzlow, 21st (35+), Chan Huynh, 29th & Mark Campaigne, 42nd (Cat 3), Matt Sheremeta, 25th & Jason Habeger, 42nd (Cat 4), Mike Coday, 30th (Cat 5B). Full results here. 5/2 - Idyllwild Spring Challenge - Mtb Cross Country: Jeff Sanford, 2nd (Cat 1, 40-44). Full results here. 5/2 - Barrio Logan Criterium, San Diego - Andrew Dickinson 34th & Charles Cushman 39th (Cat 4). Full results here. 4/26 - Kenda Cup West/Santa Ynez MTB - Griffith Vertican 5th (cat 1, 30-34); Mark Campaigne 8th (Cat 1, 40-44); Clare Campaigne 4th (Cat 3 W 40-49); Drew Campaigne 3rd (Jr Boys <10); Matt Weir 2nd (Jr Boys 11-12). Full results here. 4/26 - Dana Point Grand Prix - Jason Hock, 17th & Chan Huynh 34th (Cat 3); Andrew Dickinson 27th & Charles Cushman 33rd (30+ 4/5); Charles Cushman 16th & Jason Habeger 17th (Cat 5A). Full results here. 4/25 - Death Valley RR, Baker to Dumont Dunes - Matt Sheremeta finished 6th (cat 4s) w/ teammate Stefan Steiner a little further back. Results coming soon. 4/16-19 - Sea Otter Classic, Monterey - Cross Country: Griffith Vertican, 13th (Cat 1, 30-34), Erik Trogden, 27th (Cat 1, 40-44), Dan Schonberg, 25th (Cat 3, 35-39). Super D: Erik Trogden, 5th (40-49). Full Results here. 4/19 - Torrence Criterium - Jason Hock, 16th (Cat 3), Glenn Masuda, 7th (Cat 4). Results here. 4/18 - Devil's Punchbowl RR, Palmdale - Chan Huynh, 20th (Cat 3), Matt Sheremeta, 6th (Masters 40+ 4/5), Jason Habeger, 14th & Andrew Dickinson, 20th (Cat 5). Full results here. 4/12 - Ontario Criterium - Andrew Dickinson placed 6th (Cat 4); Charles Cushman, 26th & Andrew Dickinson, 37th (Masters 30+ 4/5). Full results here. 4/7 - San Diego Velodrome Tuesday Night Racing has started up for the season. Charles Cushman says it's fun and he placed 3rd at the first race -- Check out the details and join him for more track every Tues night. 4/5 - Sagebrush Safari, Lake Morena - Mtb XC: Ben Jones, 6th (Cat 1 35-39); Jeff Sanford 9th, Paul Klysz, 11th, Erik Trogden, 16th & Mark Campaigne, 17th (cat 1 40-44); Dan Schonberg, 7th (Cat 3 35-39); Claire Campaigne, 4th (Cat 3 W40-49); Matt Weir, 1st (Jr 11-12), Drew Campaigne, 5th (Jr Men 10&under); Annette Padilla, 1st (Cat 2 WSS). Full results here. 4/3-5 - Cyclo-vets Omnium, San Diego - Day 1 8.2 mile TT - Mike Coday, 7th & Stefan Steiner 15th (Men 35+, 4/5), Annette Padilla, 5th (Women 40+) and Matt Bigos 30th (Men 4). Full Results here. Day 2 Road Race - Matt Sheremeta, 4th & Mike Coday 27th (35+ 4/5); Chan Huynh, 10th (Cat 3), Charles Cushman, 27th (Cat 5). Full results here. Day 3 Criterium - Chan Huynh, 24th & John Genovese 29th (Cat 3); Stefan Steiner 10th (Men 35+, 4/5); Charles Cushman, 36th (Cat 5). Results here. Final Omnium points here. 3/30 - Club Meeting after the Group Ride on APRIL 11th ~ 11:30. Date change due to Carlsbad 5K on Apr 4/5. Breakfast/Lunch will be provided and we will be discussing putting on the upcoming San Luis Rey race. Plan to attend! 3/30 - Club Clothing Order - We are doing a reorder of club clothing due 4/11. Please bring your checks or cash to the club meeting on April 11th or send your order in ASAP. Here is the order form. 3/29 - Redlands Criterium - Andrew Dickinson, 11th (Cat 5); Chan Huynh, 35th (Cat 3). Full results here. 3/29 - L.A. Circuit Race - Jason Hock, 28th (Cat 3); Glenn Masuda, 37th (Cat 4) Full results are here. 3/28-29 - Fontana City National - Pro XCT & Kenda Cup West - Mountain bike cross country. Day 1 Results - Dan Schonberg, 5th (Cat 3 Men 35-39); Claire Campaigne, 2nd (Cat 3 Women 40-49); Drew Campaigne, 4th (Jr Men 10 & under); Annette Padilla, 1st (W Cat 2 SS). Day 2 Results - Ben Jones, 8th (Cat 1 35-39); Erik Trogden, 17th (cat 1 40-44), Griffith Vertican and Mark Campaigne both suffered unfortunate race ending mechanicals. 3/27 - Club Ride Change - Please note the APRIL 4th ride route has been changed to avoid conflict with the Oceanside Triathlon race route. We will be doing Inland Elfin Forest route and then having our club meeting at the Grand Deli. 3/25 - San Luis Rey Flyer is now available. Click here to view the flyer (pdf). SLR is now part of the Nature Valley Pro Ride. In its second year, NVPR is growing from three to six events. This unique program offers elite amateurs a chance to win a trip to the Nature Valley Grand Prix, the top ranked Pro/am race in the country, where they'll race on the Nature Valley Cycling Team. The Nature Valley Grand Prix, which begins June 10 in St. Paul, Minnesota, is the only race among America's biggest races to admit amateurs, giving them a chance to enjoy the full professional racing experience. 3/22 - Southridge Winter MTB Series #6, Fontana - Jeff Sanford, 1st Expert 43-50; Dan Schonberg, 1st Beginner 35-42. Results here. 3/20-22 - San Dimas Stage Race - Day 1: In the 3.8 mile hill climb TT, Chan Huynh had the fastest time for the team in 16:32 (37th, cat 3) followed by Matt Sheremeta in 16:35 (21st, cat 4) and Griffith Vertican, 16:38 (44th, cat 3). Day 2: In the road race, Chan and Griffith were 41 secs back in 50 & 51st, while Matt was 2:23 back for 50th in the 4s. Day 3: Chan finished up the criterium to finish 40th g.c. -- Full results are here. 3/19 - Club Meeting after the Group Ride on APRIL 4th ~ 11:30. Breakfast/Lunch will be provided and we will be discussing putting on the upcoming San Luis Rey race. Plan to attend! 3/14-15 - Murrieta Road Omnium - Andrew Dickinson, 2nd place overall (Cat 5) with 3rd in the Crit & 2nd in the Circuit race. Results Day 1 here. Day 2 here. 3/14-15 - Keyesville Classic, Lake Isabella - Erik Trogden placed 18th the cross country, 11th in the short track (Expert 30-44). results here. 3/14 - Racers & Chasers Mtb Spring Series #3, Vail Lake (Temecula) - Celo Pacific results (unofficial) are as follows: Annette Padilla 1ST PLACE (beginner singlespeed); Alex Ter-Vrugt 4th (expert 30-39); Matt Weir 6th (under 18); Mark Campaigne 5th (expert 40-49); Clare Campaigne 7th (beginner women 40-49); Drew Campaigne 7th (under 18); Jameson Campaigne medal winner (kids race). Full results here. 3/8 - Fiesta Island 20K Time Trial, San Diego - Ben Jones (28:07, 6th cat 1/2/3), Matt Bigos (33:10, 18th cat 4/5). Full results here. Annette Padilla did 40k in a great sub 1-hr time of 59:52! Mike Coday photo. Photos here. 3/7 - Southridge Winter MTB Series #5, Fontana - Griffith Vertican, 1st, Expert 27-34 (Fastest expert time on the day! ); Dan Schonberg, 2nd Beginner 35-42. Full results here. 3/1 - Kenda Cup West/CA Mtb State Series #1, Bonelli Park - Big turnout of ~650 racers today! Griffith Vertican 2nd (cat 1, 30-34); Ben Jones 7th (cat 1, 35-39); Annette Padilla 12th (cat 2/3 singlespeed); Eric Trogden 23rd (cat 1, 40-44); Mark Campaigne 19th (cat 1, 40-44); Clare Campaigne 6th (cat 3 women, 40-49); Drew Campaigne 4th (junior boys 10 and under); Jameson Campaigne medal winner (kids race). Full Results here. 2/28 - Santiago Canyon Time Trial - Mike Coday and Annette Padilla were the first to race in our newly redesigned 09 kits. For the 11 mile course, Mike finished in 29:03, good for 8th in the 4/5's while Annette was 5th in 34:07. results coming soon. 2/26 - Nature Valley Pro Ride schedule expands click here for the cyclingnews.com report which recognizes San Luis Rey RR. 2/25 - Celo Pacific is pleased to announce that the 2009 Mark Reynolds San Luis Rey Road Cycling Classic will be a Nature Valley Grand Prix Pro Ride qualifier for Cat. 1 Men and Cat 1/2 Women. Details on the Pro Ride are now available. Check back soon for the 09 SLR race flyer. 2/25 - The 2009 clothing order has arrived and will be distributed at the Grand Deli after Saturday's ride. Note that all orders must be paid in full before you can pick up your order. We have an updated look for 09 thanks to Jason Hock and David Bales -- make sure to tell them thanks for their work on this year's clothing! 2/25 - Trail work day: February 28th at 8:30 Calavera - click for updated details and help do your part! Also updated: The Subaru/IMBA Trail Care Crew program is coming On Saturday, March 21 in San Diego County. 2/22 - Dare to Race/Ontario Criterium - Andrew Dickenson, 19th (30+ 4/5s). Full results posted here. 2/21 - Southridge Winter MTB Series #4, Fontana - Griffith Vertican, 5th, Pro. Full results here. 2/14 - Racers & Chasers Mtb Spring Series #2, Vail Lake (Temecula) - Celo was well represented by Griffith Vertican (1st, Expert 30-39), Alex T-V (2nd, Expert 30-39), Ben Jones (3rd, Expert 30-39), Mark Campaigne (3rd, Expert 40-49), Dan Breyer (3rd, Sport 30-39), Annette Padilla (1st - Beginner SS), and Drew Campaigne (5th, Beginner <18). Full results here. New -> Race photos here. 2/13 - CX Worlds Update - Jim Cushing-murray flew over to Europe and joined Lee Willmore to watch the CX World Championships in the Netherlands (the week after Lee raced). Click here to see a quick report with photos. 2/8 - Red Trolley Criterium, San Diego - Chan Huynh, 26th (cat 3), Stefan Steiner, 24th (cat 4), Andrew Dickenson, 12th (cat 5). full results here. 2/8 - Fiesta Island 20K Time Trial, San Diego - The course was pretty wet with some mud/dirt around the edges. Nonetheless, Celo was well represented w/ Annette Padilla (1st W40-49, 35:30), Ben Jones (6th Cat 1/2/3, 28:17), Matt Bigos (17th 4/5s, 34:17), Mike Coday (7th M30-39, 29:35) and Dan Breyer supporting. Full results posted. Photos added (click rider name above). 2/7 - Boulevard Road Race - Epic Conditions! With cold temps, rain, hail, and snow, it looked really hard! Check out Griffith Vertican leading the cat 3's up the climb and other great photos here. Jason Habeger was 8th (Cat 5A). Full results here - Video of Pro/1/2 rollout! More Photos posted here. 1/31 - The Lou CX Night Race, Fresno - David Lawson was 3rd overall in the Sport race and 1st in the Sport Masters category. Dinorah Lawson won the Sport Women race. Full results are here. Photos here. 1/31 - Racers & Chasers Mtb Spring Series, Vail Lake (Temecula) - Annette Padilla won the Women's singlespeed. Full results here. 1/25 - Cross Fever #4/Last Chance CX, Silverado Cyn - Dinorah Lawson won the W35+ overall and Griffith Vertican won 3/4s overall. Annette Padilla got 2nd in the Women's 1-3 race, 3rd in 35+, & 7th in SS. Dave Lawson, 3rd overall SS. Full Results here. Final Series results. 1/24 - Masters World Cyclocross Champs, Mol, Belgium - In the 65+ age group, Celo Pacific's Lee Willmore took 13th with SoCal CX'er Robert Llamas, 10th. Full results are here. Photos of Lee Here! 1/24 - Southridge Winter MTB Series #2, Fontana - Griffith Vertican won the Expert 27-34. Dan Schonberg, 2nd (Beginner 35-43) Full results here. 1/24 - 12 Hrs of Temecula, MTB race @ Vail Lake - Ben Jones, Dan Breyer, Matt Breyer, and Alex T-V pulled off a 3rd place finish in the 4-Person Open category! 1/23 - CrossVegas to be televised this Sunday 1/25, 3pm, on Universal Sports (Channel 136 in Carlsbad on Time Warner). 1/18 - Cross Fever #3/El Dorado park CX, Long Beach - Dinorah Lawson won the women's 35+ race. Annette Padilla got 4th in the women's elite and 5th in the single speed. Elite Women's podium shot here. Dave Lawson got 3rd in SS. Griffith Vertican got 3rd (3/4s) and 5th (Elite men 1/2/3). Lee Wilmore, 6th (55+). Matt Weir & Drew Campaigne, 3rd & 4th (Boys 10-14). Dinorah's race report here. Results here. 1/16 - Club Membership Information page is updated with 2009 membership form and 2009 reimbursement form. Please print, fill out, and bring with you to the club meeting tomorrow, or mail it in. 1/15 - Club Meeting & Brunch at Grand Deli next Saturday, 12/13 after the club ride. Food provided. We will have updated 2009 membership forms on hand or look for those online tomorrow so you can print your own and bring it with you. 1/11 - Cross Fever #2/Talley Vinyards CX, Arroyo Grande - Brent Prenzlow won the Elite Men's 1/2/3 and the Masters 35+. Dinorah Lawson was 4th in the Womens 35+ with David Lawson finishing 10th in the singlespeed. Photo sets here. Full results here. 1/10 - Southridge Winter MTB Series #1, Fontana - Griffith Vertican won the Expert 27-34. Mark Campaigne, 7th place (Expert 35-43), Drew Campaigne, 4th (Beginner Men 9-10), Mathew Weir, 1st (Beginner Men 11-12), Dan Schonberg, 4th (Beginner 35-43) -- Full results here. 1/7 - Remembering Mark - tomorrow will be 5 yrs since we lost our friend & teammate. Take a moment to remember Mark and visit http://www.markreynoldsfund.org/rememberingMark/ or our page here. 1/7 - North County Mountain Bikers - click here for an update on the trails and local events. 1/6 - Interested in racing? - Check out our 09 race calendar to plan your season or find a cool race to try. 1/4 - Cross Fever #1/Hart Park CX, Bakersfield - Griffith Vertican won the Men's 3/4 and also took 5th in the Elite Men's 1/2/3. Brent Prenzlow won the Elite Men's 1/2/3, the Masters 35+, and the $100 Bidart and Ablin Hillclimb Challenge. Lee Willmore was 3rd in the Masters 55+ and the 5th singlespeeder. Photos by Larry Aronat here. Race report and Results here. 1/4 - Racers & Chasers MTB XC, Vail Lake (Temecula) - Mark Campaigne won the Expert 40-49 field, while Annette Padilla won the Women's category. Drew and Jameson Campagine also raced in the beginner and kids race. More Race photos here by Paul Chan. 1/1/09 - Happy New Year!